In a water-scarce country such as South Africa, timber and fibre production often stands in conflict with catchment water yields. The optimal provision of both is sought. Forest hydrological experiments improve our understanding of the soil–plant–atmosphere continuum and facilitate the development of rapid estimation techniques through extrapolation. 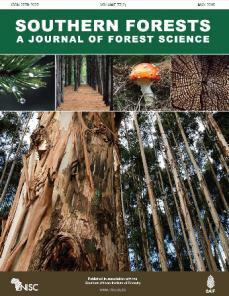 To quantify and characterise the influence of local environmental conditions on single-tree water use, whole-tree daily sap flow for three indigenous afrotemperate tree species (Podocarpus latifolius, Ilex mitis and Ocotea bullata) and one introduced and intensively managed tree species (Pinus radiata) was measured. Hourly sap flux, soil water content and weather data were collected for a year in an indigenous forest and a plantation stand in the southern Cape afrotemperate region. Correlation analyses for whole-tree daily sap flow and environmental variables related to water and energy availability were done. Cross-validation was then employed to test combinations of non-covarying independent parameters for the prediction of whole-tree sap flow responses to environmental variables. Generalised linear models were developed for each species. For the Pinus radiata plantation species, separate models were developed for tree specimens in the subdominant, average and dominant diameter classes. The dominant diameter class model had the best R2 value of 0.80 (p < 0.00). For the indigenous tree specimens, the Ilex mitis model had the highest R 2 (0.65, p < 0.00). Validation of the models with independent data indicated positive and significant Pearson correlation coefficients for the observed versus predicted daily sap flow values, with the dominant diameter Pinus radiata specimens showing the highest correlation value (r = 0.91, p < 0.00), whereas those for the indigenous species were r = 0.63, p < 0.00; r = 0.78, p < 0.00; and r = 0.66, p < 0.00 for Podocarpus latifolius, Ilex mitis and Ocotea bullata, respectively. The results indicate that variable-specific linear models can be employed to estimate whole-tree sap flow and water use as a function of environmental factors with an acceptable degree of accuracy for both introduced and indigenous tree species.